Deep in the gorge country that falls off the Ethiopian plateau, workers in boots and hard hats are hammering, drilling, blasting and digging their way into the mountainside for the foundations of the vast wall that will, when finished, create the second largest hydroelectricity dam in sub-Saharan Africa. Teams of workers are blasting out the "keyhole" - the slot in the side of the valley that will hold the dam wall in place. 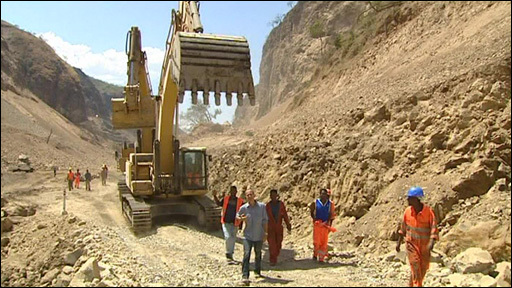 Others are finishing the concrete lining to the last of three 1,000m long tunnels that have already begun diverting the Omo River waters around the main construction site. Africa is in the dark. Give us a choice. Should we stay in darkness? According to the engineers, they are now about a third of the way through the project, and on schedule to finish the Gilgel Gibe III hydroelectricity project sometime in 2012. By then, the wall will soar 240 metres high - the tallest of its type anywhere in the world; holding back a reservoir 150 kilometres long. The dam will provide 1,800 megawatts of electricity. That will more than double the country's current generating capacity in one hit, and according to Prime Minister Meles Zenawi, solve a national energy crisis. "We cannot afford not to have Gilgel Gibe III," he said. "We need that type of mega-project given the increased domestic demand and the requirements of export. "And secondly, it enables us to store water and regulate the flooding [downstream in the Omo River]." He rejects fears that some 500,000 people could see their livelihoods destroyed by the dam. The dam will also produce far more electricity than the country is capable of consuming. The vast bulk of it has been earmarked for export to neighbours like Sudan and Kenya. "That would provide us with valuable foreign currency that will help with our balance of payments," said the prime minister. So urgent was the need to get the dam built quickly that the government short-circuited the usual internationally accepted procedures for these kinds of massive infrastructure projects. Usually, a government will first conduct a feasibility study followed by an environmental and social impact assessment to decide whether it really is wise to go ahead with the plan. Then, it will raise the finance, call for competitive tenders and award the construction contract. Instead, the government first negotiated the contract directly with Italian civil engineering giant Salini Costruttori. It then went looking for the finance - a procedure that has left the government with a massive hole in its budget. The two financial institutions that the government had hoped would back the project - the World Bank and the European Investment Bank - have both refused to get involved because the government broke international and domestic transparency rules by dealing directly with Salini. "I think quite rightly, we have an obligation not only to do the right thing but to demonstrate very clearly that we are doing the right thing," said Greg Toulmin, the World Bank's country director for Ethiopia. "In order to do that, we have to go through all these very meticulous processes to check all the aspects of any operation that we provide loan or guarantee to. That's something that takes time." It's a luxury that Mihert Debeba, head of the Electricity Corporation, said Ethiopia simply can't afford. He said: "Africa is in the dark. If we have to use very luxurious preconditions we wouldn't develop any hydro-power. "Give us a choice. Should we stay in darkness? Should we avoid all this development?" The corporation also short-circuited the environmental and social impact assessment (EIA) process. Instead the study - which gave the project a clean bill of health - was published two years after construction began. 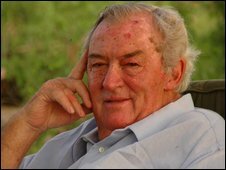 One of the project's staunchest critics, Kenyan ecologist Richard Leakey, suspects the study was produced with one aim in mind. He said: "The scientists that I've shown [the EIA] to - some of whom have worked in Ethiopia for years and may have even advised the Ethiopian government at some point - suggest it is fatally flawed in terms of its logic, in terms of its thoroughness, in terms of its conclusions. "And it looks like an inside job that has come up with the results that they were looking for to get the initial funding for this dam." Before any large project can go ahead, Ethiopia's Environmental Protection Agency first has to give its approval. Twolde Berhan Gebre heads the agency, and he dismisses critics like Mr Leakey as misguided. "Leakey's a big name but I don't know what he's based his arguments on. I don't think he's right," he said. "My experts have also examined it. They have studied the environmental impact statements. They have visited the site and I know them. "I don't know you. I trust them and I don't care for what you say." Still, Mr Leakey's criticism echoes that of another collection of European, American and East African academics calling themselves the "African Resources Working Group", headed by University of Montana Geography Professor Jeff Gritzner. The group has released a commentary on the environmental research, which asserts: "The document rests on a series of faulty premises and it is further compromised by pervasive omissions, distortions and obfuscation. "The downstream EIA is laced with tables and figures with multiple types of 'quantitative data', creating the illusion of a scientific work. "While this practice is well known to increase the likelihood of approval by development, finance and oversight agencies, it is fully unacceptable. "The quantitative [and qualitative] data included in virtually all major sections of the report were clearly selected for their consistence with the predetermined objective of validating the completion of the Gibe III hydro-dam." The commentary goes on to insist that rather than being beneficial to the river valley as the government insists, the dam will "produce a broad range of negative effects, some of which would be catastrophic" to both the environment and the indigenous communities living downstream. The science is still very much in dispute - a factor that Mr Leakey believes is reason enough to invoke the precautionary principle and stop the project before it is too late. 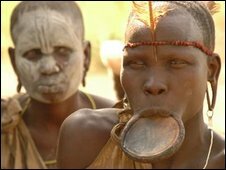 For if the Ethiopian government is wrong, those communities living along the lower Omo River Valley all the way down into neighbouring Kenya will pay a heavy price.